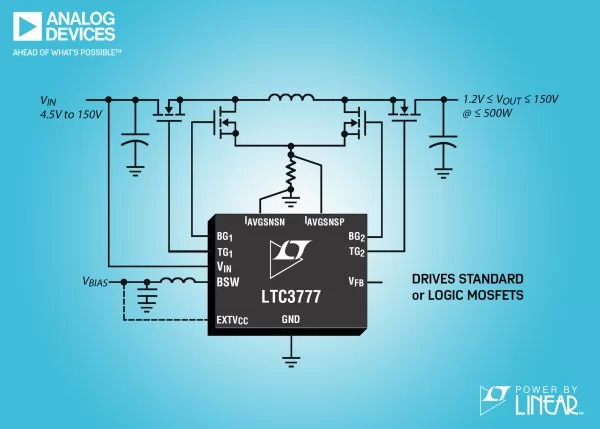 Analog Devices announces the Power by Linear™ LTC3777, a 150V high efficiency (up to 99%) 4-switch synchronous buck-boost DC/DC controller, which operates from input voltages above, below or equal to the regulated output voltage. Its 4.5V to 150V input voltage range operates from a high input voltage source or from an input that has high voltage surges, eliminating the need for external surge suppression devices, ideal for transportation, industrial and medical applications. The LTC3777 is available in a 48-lead e-LQFP package with pin skipping for high voltage spacing. Extended and industrial versions are available from –40 to 125°C.